The International Academy of Oral Medicine and Toxicology (IAOMT) presents physical evidence of the release of mercury vapors from a 25-year-old amalgam filling. The work done indicates that the fillings out gas mercury. In fact, the fillings out gas mercury at levels a thousand times more than what is considered safe. 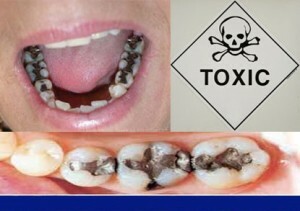 When heated by drinking hot drinks such as coffee and tea or by chewing gum or food, these fillings can out gas mercury a million times more than what is considered safe. Also presented is the overview of scientific data. In fact, this data confirms the distribution of the mercury to vital organs of the body such as the kidneys and brain. The distribution occurs in as little as two weeks. The work done indicates that it takes 25 years for the body to eliminate half of the mercury taken in on the first day the amalgam fillings are put in. This means that 100-year-old person still will not have gotten rid of all of the mercury they were exposed to in childhood. We invite you to watch the video below produced by the IAOMT. It goes quickly and uses words that you may need to define to understand. Please put in the effort to fully comprehend this video. Then look at it several times to make sure you fully benefit for it. Why don’t vaccines give every child autism?